Welding goggles protect your workers from sparks, heat and bright light created during welding. Providing each worker with a welding goggle not only protects their eyes, but also helps businesses maintain compliance with OSHA’s regulations about personal protective equipment. At Seton, we offer a variety of styles and brands to best suit your needs, including United® Brand Welding Goggles. These goggles offer protection against a variety of hazards created in welding environments. Not quite sure what you’re looking for? Be sure to review OSHA’s guide for Hot Work to maintain compliance and protect your workers. Welding is one of the most dangerous professions on a construction site. Welders face serious hazards to their hands and eyes due to the intense heat, sparks and bright light created while welding. Protect your workers against these serious threats by supplying them with welding goggles. 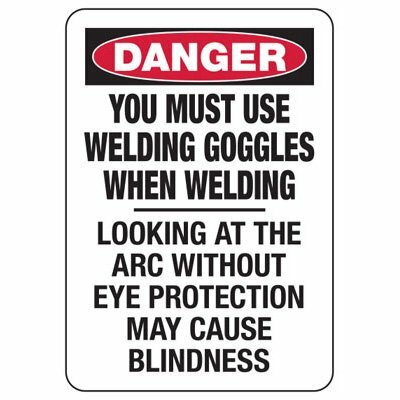 A welding goggle features a dark lens to protect the eyes from bright sparks, as well as keeps dangerous levels of heat and fumes away from the eyes. Supplying workers with adequate goggles also helps you maintain compliance with OSHA’s regulations about giving workers adequate personal protective equipment. At Seton, we offer a selection of welding goggles that help you comply, including Jackson Safety Flex Frame Welding Goggles. These welding goggles not only comfortable, but they use an IRUV shade 5 filter lens for full protection and are even compliant with ANSI Z87.1-2003 High Impact standards. We also offer a variety of other welding protection items, including flame-retardant jackets, welder’s gloves, and welding helmets.